Laila Maali owns Grape Vine in Orland Park, Ill. She’s part of the region’s large Palestinian diaspora. 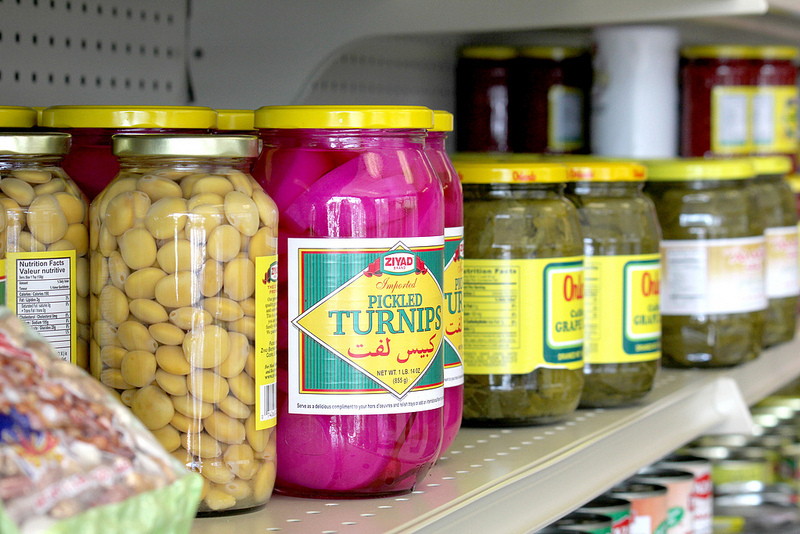 Grape Vine stocks middle eastern delicacies like butter ghee, red lentils and pickled turnips. 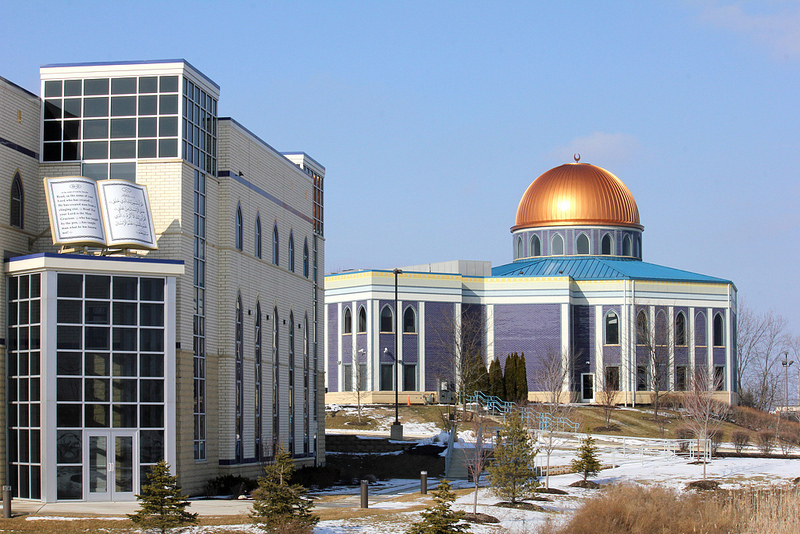 The Prayer Center mosque in Orland Park was built in 2004 to accomodate the region’s growing Muslim community. Chicagoans are fond of saying that there are more Poles here than anywhere outside of Poland. But did you know there are more people of Palestinian descent living in Chicago’s southwest suburbs than in any other city in America? I didn’t either, until I went to Orland Park last week. Orland Park, Ill. is a town of about 56,000 sandwiched between routes 55 and 57. It has a big mall, and a lot of smaller strip malls, many new housing developments and a ton of beautiful, wooded forest preserve land. And, along with neighboring suburbs like Bridgeview and Oak Lawn, it has a sizable Arab American population. For the past few weeks, my boss has been sending a different web producer and reporter from the broadcast side of things out to the suburbs to explore, discover, report etc. We’re supposed to go in not knowing much, but then we’re supposed to find a quick-turnaround story and report it in one day. Last week it was my turn; I went out with Michael Puente, who normally covers Northwest Indiana for us — and is super awesome. Michael actually worked at the Orland Square Mall — in a formalwear store! — when he was in his early 20s. But I knew nothing about Orland Park. I had heard that the southwest side of Chicago around Marquette Park used to be a landing pad for Arab immigrants (I learned this from the Arab American Action Network after I did a story with them in 2010 for my series Dear Chicago), but I had no real concept of what that community was like. I certainly had never heard that Chicago was home to the country’s largest population of Palestinian immigrants. 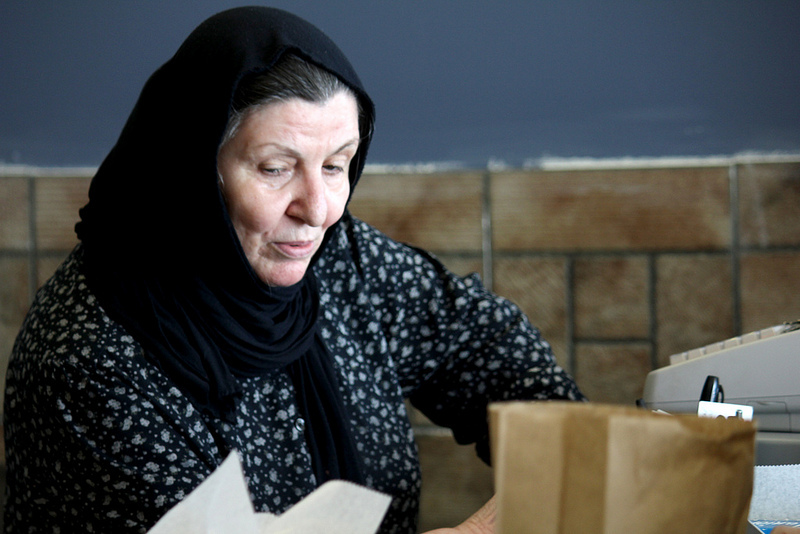 But when Michael and I went to Grape Vine, a small middle eastern bakery and grocery, we met the owner, Laila Maali, as well as her landlord and her friend/handyman. Her landlord, Edward Hassan, told us that all three of them came from the same village near Ramallah and that there were more people from their village living in Chicago now than there were left living in the village! That claim obviously caught my ear; I knew when he said that there was probably a story there, one that I had not heard before and one that surprised me very much. Hassan’s claim turned out to be exaggerated, but true in its nature; his home village, Beitunia, has traditionally been the largest feeder village of Palestinian immigrants to Chicago. Coincidentally, the story I was working on last week tied into another project I’ve been working on — the Curious City podcast. I took over podcasting for WBEZ recently, and I’ve started working more closely with Jenn Brandel by helping edit the podcast every week. Last week’s episode featured a story reported by Odette Yousef, our North Side bureau reporter. It deals with the resettlement of refugees on Chicago’s North Side, and answers the question: What is the most diverse neighborhood in the city? The part that really caught my ear was when Curious City/Bureaus editor (and my pal) Shawn Allee connected the dots between U.S. immigration policy and the physical makeup of the city. When our immigration policy allowed more people from one country to come and settle together, you got neighborhoods like Argyle Street, home to Chicago’s Vietnamese community. But when we let only fewer numbers of people come to the U.S. it was harder for them to make the kind of neighborhood impact that’s easy to see from other ethnic communities. (I’m probably bastardizing Shawn’s words a little bit, but luckily you can listen to the audio above.) I had never made that connection before, and I found it really interesting. Palestinians immigrants living here are not refugees in that the U.S. government does not recognize them as such. But they and Chicago’s other Arab immigrants have clearly left their mark on the region, whether it’s in the form of the new mosque in Orland Park or the businesses along Lawrence and Kedzie on the Northwest Side of Chicago. Next though, I want to go to Bridgeview, Ill. It has the oldest and most established Arab American community in the Chicago area, and the oldest mosque. I think it is also more densely populated and urban, as it has its center between 79th and 87th along Harlem. (How that is not a part of Chicago I don’t know.) The expert I interviewed for my story, Louise Cainkar of Marquette University, said she once counted over 100 Arab-owned businesses in that one mile stretch of street!